When the cavalry leading the Patriot column approached, the guards posted on the road fired their weapons and retreated to join their main body. After an initial cavalry charge, the Patriot infantry moved up. In the confusion of the battle, the Patriots were able to turn the Loyalist flank and gain control of the ridge. General Rutherford, then only a few miles from Ramsour's Mill, received word of the action and immediately dispatched his cavalry to assist and hurried the infantry along. Casualties were difficult to accurately assign to each side since almost no one was wearing any sort of uniform. Estimates place the number of dead on each side at 50 to 70, with about 100 wounded per side. The battle, in which muskets were reportedly sometimes used as clubs due to the shortage of ammunition, was reported to be fought between "neighbors, near relations, and friends". The battle so badly demoralized the area Loyalists that they never organized again in that area. Moore and about 30 men joined Cornwallis at Camden, where Moore was threatened with charges for disobeying Cornwallis. The Tories were embodied at Ramsour's Mill through the efforts of Lt. Col. John Moore and Maj. Nicholas Welch. These officers left the victorious British on the march from Charleston and arrived at their homes early in June. Moses Moore, the father of Col. Moore, was a native of Carlyle, England, married Miss Winston, near Jamestown, Virginia, and came to this section with the pioneers. Esther, a sister of Col. Moore, married Joshua Roberts, a patriot soldier. The late Capt. John H. Roberts, a grandson, lived on the Moore homestead. It is situate on Indian Creek, 8 miles southwest of Ramsour's Mill. Moore was an active partisan throughout the Revolutionary War. Welch was a son of John Welch, and was reared next neighbor to Moore on Indian Creek. He was of Scottish descent, of great fluency of speech and fine persuasive power. They bore English commissions, were arrayed in splendid official equipments and made lavish display of British gold. By June 20, these zealous loyalists collected at Ramsour's Mill a force of 1,300 Tories, and were actively engaged in their organization and drill preparatory to marching them to unite with the British in South Carolina. They occupied a well chosen and advantageous position for offense and defense. It was on a high ridge that slopes three hundred yards to the mill and Clarke's Creek on the west and the same distance to a branch on the east. 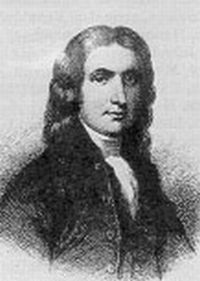 Col. Francis Locke collected a force of Rowan and Mecklenburg militia to engage the Tories. His detachments met at Mountain Creek, 16 miles from Ramsour's on Monday, June 19, and when united amounted to 400 men. They marched at once to the assault of the Tory position. 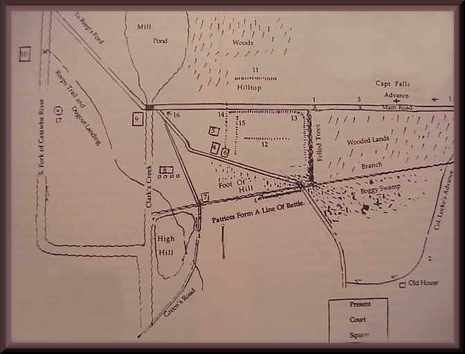 At dawn, in 2 miles of Ramsour's, they were met by Adam Reep, a noted scout, with a few picked men from the vicinity of the camp, who detailed to Col. Locke the position of the British, and the plan of attack was formed. The mounted men under Capts. McDowell, Brandon, and Falls, marching slowly were to follow the road due west to the camp, and not attack until the footmen under Col. Locke could detour to the south, and reach the foot of the hill along the Tuckaseegee road, and make a simultaneous assault. They proceeded without other organization or order, it being left to the officers to be governed by circumstances when they reached the British force. Some of the Whigs obliqued to the right, and turned the left flank of the Tories; while Sharpe led a few men beyond the crest of the ridge, and, advancing from tree to tree, with unerring aim picked off the enemy's officers and men, and hastened the termination of the conflict. The action now became close and warm. The combatants mixed together, and having no bayonets, struck at each other with the butts of their guns. When the Whigs reached the summit they saw the Tories collected beyond the creek, with a white flag flying. Unable to make it to the bridge, 50 Tories were taken prisoners. Those beyond soon dispersed and made their escape. Almost 1/4 of the Tories were unarmed, and they with a few others retired at the commencement of the battle.